Theoretical astrophysicists have observed that a gigantic black hole, Sagittarius A*, has been thought to take up this central space. Some experts also assert that there is scope for many other black holes in the first parsec or so, away from Sagittarius A*. A new paper in Nature documents the detection of signals from this region that are likely to correspond to at least 12 new black holes in this peri-Sagittarius A* area. Sagittarius A* is the name given to a super-massive black hole that may determine the shape and function of the Milky Way. Its presence is also necessary for models of our galaxy's origins and formation. They will also allow for the presence of many other smaller black holes, which are thought to occupy the first parsec of space around Sagittarius A*. The black holes may exist in a large number, which could be as much as 20,000. On the other hand, they exist mostly in theory and have not yet been detected by any astronomical instruments to date. However, a research group, made up of scientists from the Harvard-Smithsonian Center for Astrophysics, the Columbia Astrophysics Laboratory, the Space Science Institute in Colorado, the Chilean Millennium Institute of Astrophysics and the Institute for Astrophysics at the Catholic University of Chile, have published new evidence that indicates the discovery of twelve characteristic X-ray signals in the first parsec away from Sagittarius A*. The signals are associated with low-mass binary systems that are likely to contain one relatively small black hole (measuring about a single solar mass) each. Therefore, its detection is taken as a handy marker of such a black hole. The researchers, led by Charles Hailey of Columbia, have documented the discovery of 12 such black holes in the immediate vicinity of Sagittarius A*. These bodies are distinguished by the reduced energy of their emission spectra compared to the higher-energy bands associated with white dwarf stars. White dwarfs are also thought to be present in the first few parsecs away from the galactic center. The group of experts detected just a dozen of the low-energy spectra. But, they asserted that the signals' distribution patterns in the relevant space and their observed luminosities could mean the presence of hundreds more in the same region. On the other hand, the same signal types could probably be emitted by certain pulsar types. These stars 'pump' their emissions out at rates in the millisecond range, while rotating in a consistent manner. The authors of this new Nature article concede that as many as half of the additional signals could be associated with pulsars rather than black holes. The authors note that the spatial distribution system is likely to be related to the formation of an initial stellar disk around Sagittarius A*, developed earlier in the galaxy's history. Alternatively, this distribution pattern could be related to the effect exerted by Sagittarius A* on the galactic clusters nearest to it. In other words, a picture painted using binary systems that are being gradually pulled into the central black hole. The distribution of these systems may also dictate the gravitational wave content around Sagittarius A*, scientists say. The new discovery may also corroborate models of galactic formation and function, depending on the presence of smaller black holes surrounding Sagittarius A*. This phenomenon is known as a "density cusp" of black holes with the mass of at least one star. These latest findings may also confirm the theory of "dynamical friction", thought to be the force causing black holes to accumulate around a body such as Sagittarius A*.Additionally, the theory allows for the maximal figure of 20,000 and not the hundreds suggested in this study. A new astrophysics paper has reported the detection of signals which may be associated with the low-energy, low-mass X-ray bodies, indicative of solar-mass black holes. The signals could indicate that these black holes accumulate in great numbers within the first parsec closest to Sagittarius A*, the Milky Way's central feature. The conclusive confirmation of the black holes' presence could lend much greater weight to astrophysical theories of the galaxy, as a whole. 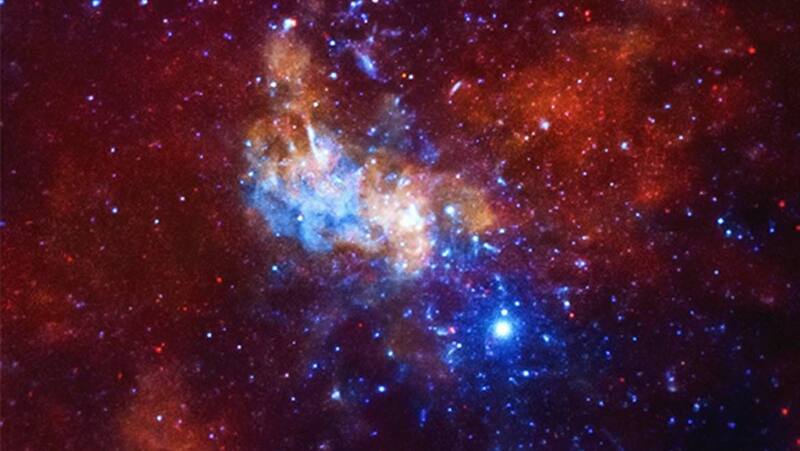 Top Image: The central Milky Way region, including Sagittarius A*, observed using the Chandra telescope. (Source: NASA/Chandra X-ray Observatory (public domain)). Hailey CJ, Mori K, Bauer FE, Berkowitz ME, Hong J, Hord BJ. A density cusp of quiescent X-ray binaries in the central parsec of the Galaxy. Nature. 2018;556:70. Levin Y, Beloborodov AM. Stellar Disk in the Galactic Center: A Remnant of a Dense Accretion Disk? The Astrophysical Journal Letters. 2003;590(1):L33.